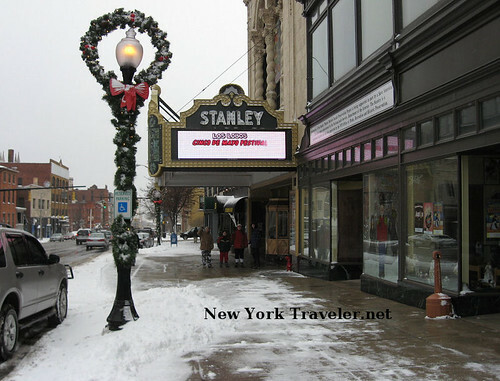 The Stanley Theatre is a beautiful historic landmark, built during the “movie palace” era when the entertainment business was really rising in America (early 1920s); the Stanley is situated right in downtown Utica. I visited the Stanley in 1988, when I saw Carman in concert (what fun that was!). 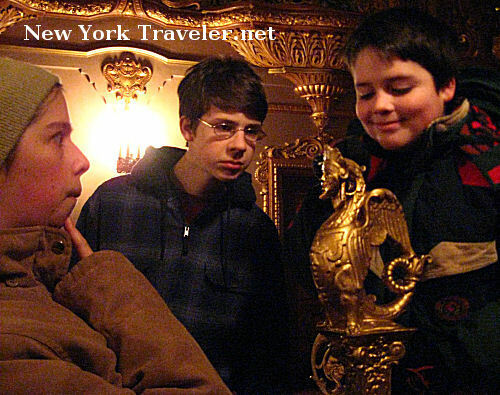 The kids and I took a short tour of it several years ago (before I had a camera). 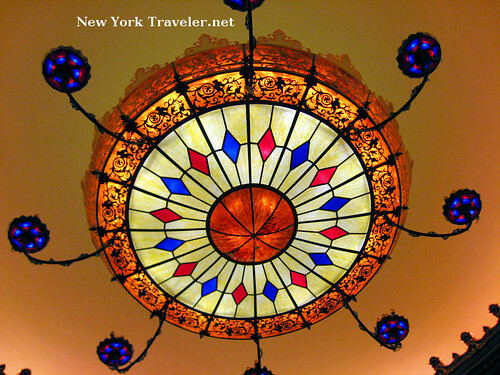 The Stanley was recently restored, and this was our first visit since then. I’d called ahead and then spoken with the manager at the ticket booth. She said we could explore the theatre (she wouldn’t show us around) but we had to stay away from the back of the building where the landing dock is. Fine with me. I was mostly interested in the architecture. The manager and the ticket window clerk were rather cold and unfriendly, though. 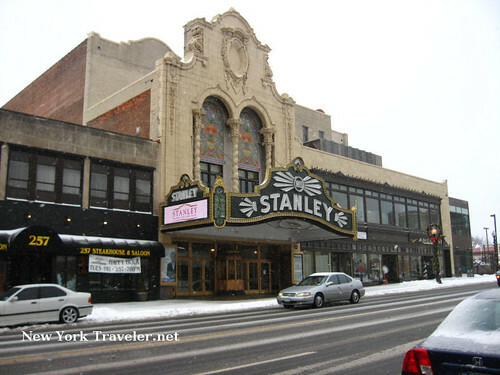 The Stanley is still in use; numerous plays and musicals are held here. The annual Nutcracker Suite ballet, with local dancers, recently ended. 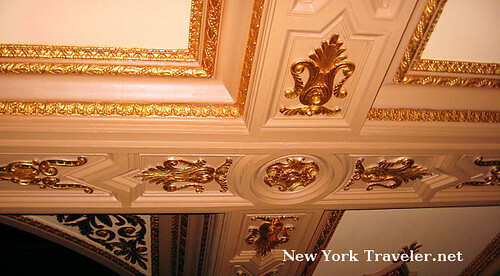 The Stanley is an example of “Mexican Baroque” design, by famous architect Thomas Lamb, who designed several hundred ornate palacial theatres worldwide. 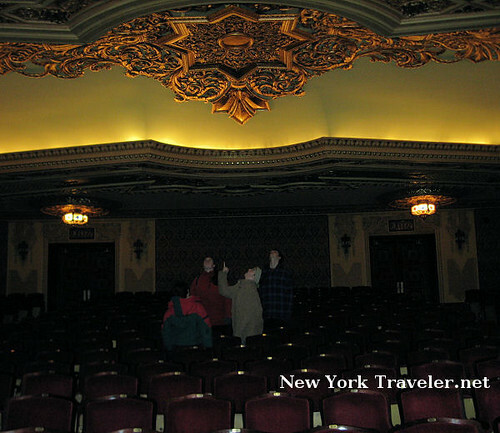 The Stanley Theatre in Utica is one of the few remaining Lamb buildings left in the world. The Stanley can hold about 3,000. It is just gorgeous. But the place is very dark. My little camera staggered to keep up. We explored the main seating area first. Not surprisingly, the kids loved the stage. The large ceiling light looked like a spaceship. Here’s a closeup. Very beautiful. We meandered upstairs to look at the balcony, but for some odd reason, someone turned out the lights on us. It was a very bad move– the balcony has a slight pitch forward and with everything suddenly dark, we had no idea where to go. We had to carefully pick our way down in the dark to be careful we didn’t fall forward. I have no idea why the lights were turned off on us. 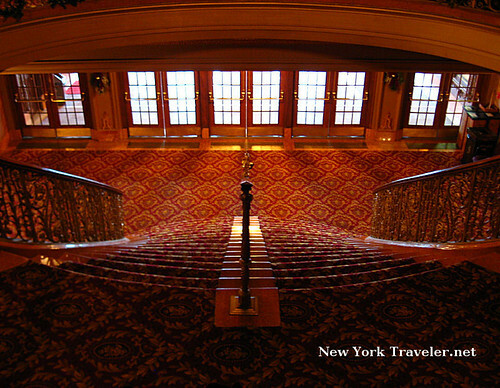 We had been given permission to explore the entire theatre except for the back landing dock area. ?? I decided to leave the theatre and not explore any further. It was a really nasty thing to shut off the lights while we on the precipice of the second floor. No one met us at the window as we left. 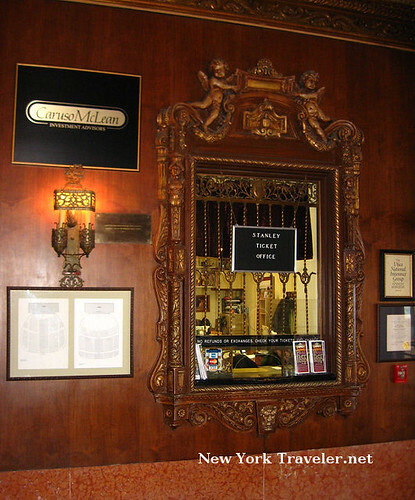 I do not remember the people at the Stanley being so cold and unfriendly when we’d visited in the past. Either we came at a bad time (although the manager did say it was fine for us to visit that day) or they’ve got a bunch of new, grumpy people hired. Too bad. 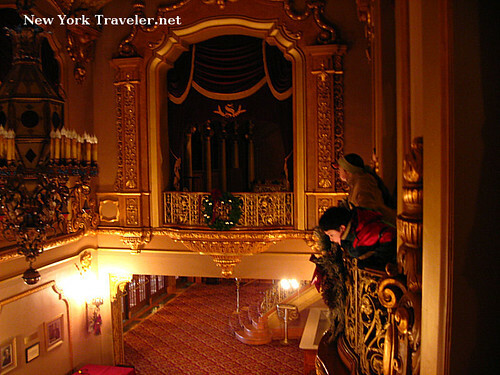 But nonetheless, it was a stupid thing to shut off the lights while we were on the balcony level. I’ll have another post with more photos of the details of the architecture. The Stanley is indeed a beautiful place, quite a contrast from the hospitality we received. 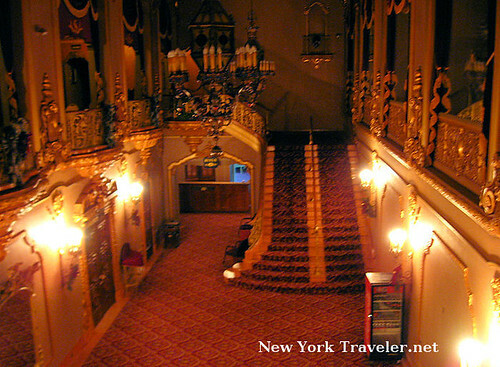 What a beautiful theater! 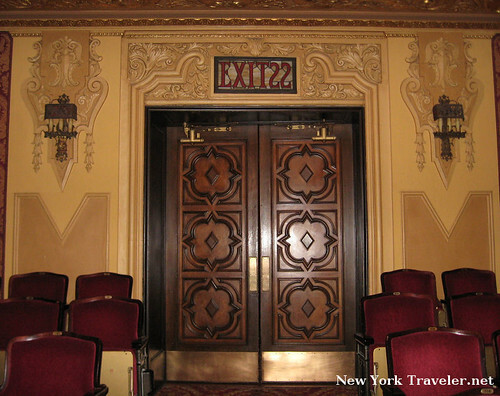 The Stanley reminds me of the craftmanship that was put into New York City’s many Broadway and Off Broadway playhouses of the same time. 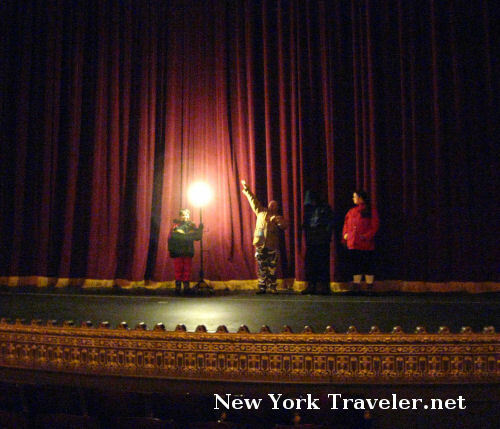 The manager missed a perfect opportunity to showcase the theater. You’ve done them a great service by sharing these photographs with the world. I think a family pack of free movie tickets would be adequate compensation (popcorn or fountain drinks included). @Matt– hoh boy, I wish you were in charge! lol Then again, if you were in charge, I’m sure we would have had a much better time! 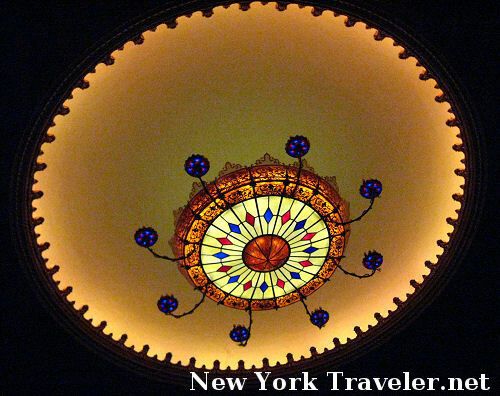 @Karen– I wonder if your theatre was built by the same Thomas Lamb? 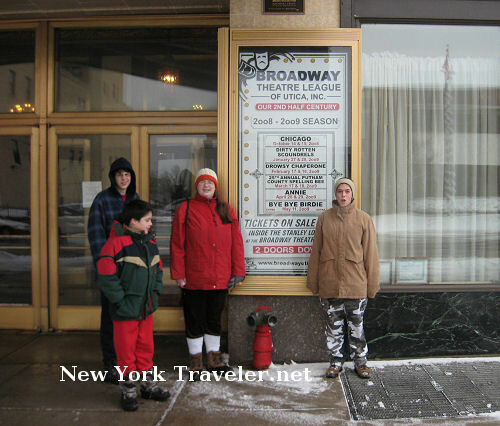 He did do other such theatres in the U.S.
@Chilly– yeah, it was cold. It IS cold! Only 9 degrees right now…. That was a rude and a dangerous thing to do. I am glad you made it down without tripping or falling. It looks like a beautiful place. 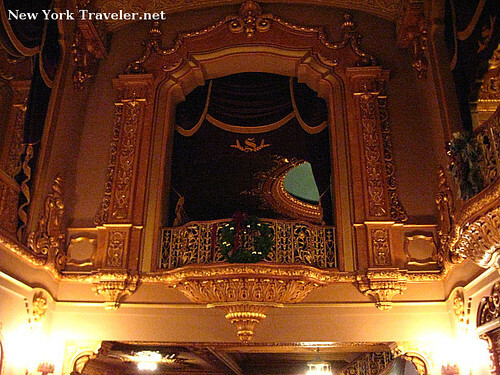 We have a theater like that in Indianapolis. It is fun to attend things there. Sorry about your cold reception. It is a beautiful place, and this city has many things like this (Munson Williams Proctor Arts Institute) that you would not expect from a city this size. As amazing as it is, your reception does not surprise me, as many people here aren’t that friendly or never attended people skills 101/tourism basics.